1. Watch for the market to make a strong move going into 1:48. Look for the 20 EXMA to be well above (if move is up) or below (if move is down) the 110 EXMA. Ideally, the separation between the averages should be about 3 to 4.5 points, and prices should be staying on one side of the 20 EXMA. If you see this setup, carefully trail an entry stop 1 point behind the 20 EXMA. If you do not see a clear setup, skip the trade. 2. When elected, place a stop 3 points from entry. Move this stop 1 point for every 30 minutes after entry. On this one, the setup was not quite as anticipated, so I watched, afraid that the MoonTide turn had washed out. 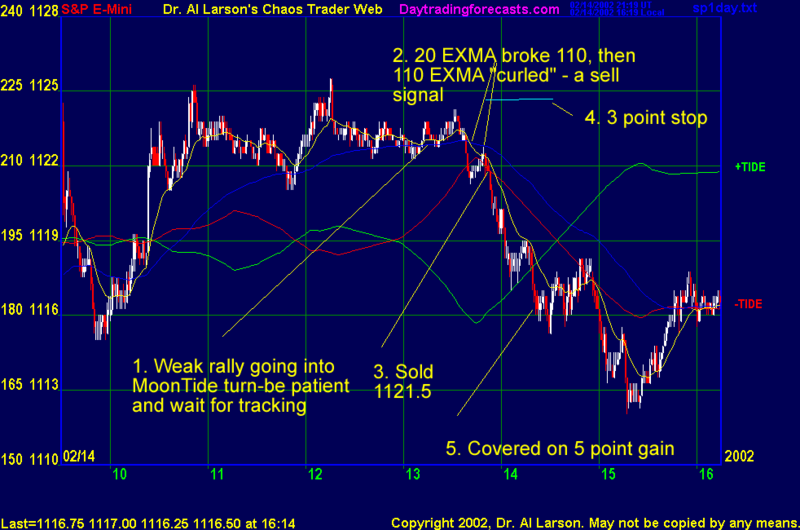 Then the market broke, the 20 EXMA crossed the 110 EXMA, and the 110 curled over sharply. This all confirmed the turn, so to me, the trade was on. The only other choice was to skip the trade, which is also OK, since it cost nothing and tomorrow is another day. This trade was a nice one. I love it when the Tides work like this. Forecast, Plan, Track, Trade.